Andrew ‘Ender’ Wiggin isn’t just playing games at Battle School; he and the other children are being tested and trained in Earth’s attempt to find the military genius that the planet needs in its all-out war with an alien enemy. Ender Wiggin is six years old when his training begins. He will grow up fast. Ender’s two older siblings, Peter and Valentine, are every bit as unusual as he is, but in very different ways. Between the three of them lie the abilities to remake a world–if the world survives. Many male children covet uniforms and the manly art of war – and on the surface that is what Ender’s Game appears to be about, a wish-fulfillment novel for the pre-teen set. But it isn’t only that. Science Fiction is an accumulative literature, perhaps more so than any other kind. Good creations stick in SF and accumulate and grow. Robots once invented, need not be reinvented. Faster than light travel, time travel or Asimov’s “three laws” are tools which once created need not be ignored as outside the scope of another SF novel, quite the contrary in fact. Simply ask yourself; in what other literature could a constructed story device like an “ansible” (invented by Ursula K. Le Guin in 1966 but used in Ender’s Game) be mentioned without renaming it? But it is not just the story props that SF shares, the concepts and themes of science fiction can never be fully appreciated in isolation. Every science fiction story is in dialogue with another. Ender’s Game is especially engaged with two other superlative science fiction novels that preceded it, namely Robert A. Heinlein’s Starship Troopers and Joe Haldeman’s The Forever War, and like those two masterpieces of science fiction Ender’s Game has something new and unique to say. Whereas Starship Troopers can be viewed as the relationship between a teenager’s individualism and his relationship to society (a neo-Hobbesian social contract concept typical of mid-career Heinlien), and The Forever War as a discussion of that same relationship but with a college aged young man and his more skeptical worldview (the post Vietnam influence) Ender’s Game engages neither an adult’s nor a teen’s relationship to his society its war. Instead Ender’s Game is that relationship from a child’s perspective. It is also, paradoxically, not a grunt’s view of a war, as was the case with both Heinlein’s and Haldeman’s novels, but rather is about how the supreme commander of an interstellar war is created. Orson Scott Card has not ignored the disconnect between a child’s desire to play at war and the brutal cost of killing, and the burden of ultimate responsibility. We primarily follow Ender and his classmates as they train to command Earth’s military in a genocidal war against a hostile alien threat, but the parallel story of his two siblings back on Earth compels equally. Each character in this novel is in a chess match of emotional and philosophical conflict with one another and their society. There are a few better hard science fiction stories, and a few better soft science fiction stories, but there are fewer science fiction stories as well constructed and emotionally satisfying as this one. The 20th anniversary of the novel’s re-publication brought about this audiobook. It is regrettable that the cover art of this edition is as generic as it is because the folks at Audio Renaissance have quite literally have brought greatness to the text. They’ve included an introduction and a postscript read by Card himself, both of which place the novel and the audiobook in its context as well as enlightening us to the author’s method of its construction. Multiple readers lead by Stefan Rudnicki work perfectly to vocally illustrate each chapter, character and scene. Stefan Rudnicki, Harlan Ellison, Gabrielle De Cuir, David Birney and the rest of the readers have given us an audiobook perfectly rendered. In what is the pattern for the Enderverse novels adapted for Audio Renaissance readers trade off at the ends of chapters, and when two unplaced voices are unattributed – except by what they actually say – two actors engage in conversation. Multi voiced readings have never been better. 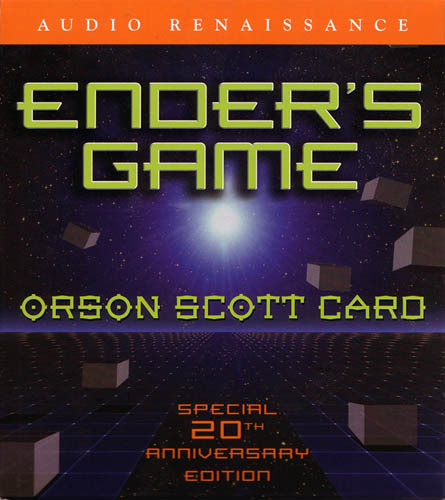 And so it is with great pleasure that we enter this Special 20th Anniversary edition of Ender’s Game as the first into the ranks of the SFFaudio Essential audiobooks. Here at SFFAudio, we have considered several different ways to present what we think are the finest audiobooks out there. At one time we had a favorites list, then we considered rating each audiobook using a 5-star system. 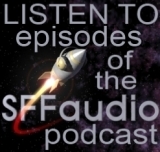 The SFFAudio Essential designation is what we landed upon. An audiobook earning a place on the SFFAudio Essential list is a five-star gem of an audiobook – a great place to start if you are new to science fiction and fantasy audio, and a necessary addition for collectors. thank you for listing the full cast of the audio, I have been trying to find out who read Valentine’s part and yours is the only website with that information. thank you. I thought it was amazing audio, loved listening while at work.